Personal web pages are roughly analogous to indiscriminately taping those little cardboard holiday decorations to one's window, even for holdays you don't celebrate. Or holidays you despise, or holidays that happened months ago. Rather like the web, in fact. A lot of faded cardboard decorations taped to window glass whose occasion has generally passed and that curl up at the edges. Devin Carraway is an assortment of typical and atypical characteristics assembled in the form of a longhaired flagrantly liberal UNIX programmer, self-titled engineer and sometime sysadmin. He writes code. He's 5'9.4" and narrower than the models in weight-loss commercials. Cynical to a fault, and then way past a fault, to the degree of vanishing into some sort of poorly-translated east german political tome college students give up halfway through. Speaks in long sentences and enjoys polysyllablic diction. Unforgiving and usually unaccomodating of ignorance, stupidity and thoughtlessness other than his own. Self-effacing and egotistical in varying proportion. None of my pages are kept up to date, few of them are accurate. Some are outright lies. If you wanted truth, aside from Keats' beatifics, you've come to the wrong medium. Kim Alm described personal pages as "... the pet rock of the 90s. They all have them, they all think they're very cute. But in a few years they're going to look back and be pretty embarrassed." I certainly hope so. You've come this far. Abandon free will and choose from these. Or be not a mouse but a (wo)man, and choose one out of sheer desperation anyway. 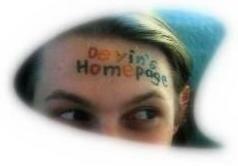 homepage at devin dot com. PGP key is here. For the visually disabled reading the page with text-to-speech converters: the rest of this is in tables, and isn't worth reading anyway. Written using emacs and vim. Incidentally, chances are if you type anything in there it may be months before I see it, if ever. If you've got something important to say, email me instead. (an experiment in PHP; sorry for the resemblance to a any one of a vast number of tacky guestbooks adorning the pet-rock personal pages of the world; GPLed source is here). There are lots of Devins in the world, but only one domain name for the lot of them. Read this before you flame, eh? Keep in mind that there have been many, many people in the world capable of thinking of far better insults to put in that field than you. Many of them were AOL users. You've got a ways to go. Best viewed with much better hardware at higher resolution and greater color depth and in a better state of mind than whatever you are now using. Valid HTML 4.0, valid CSS. Yay.